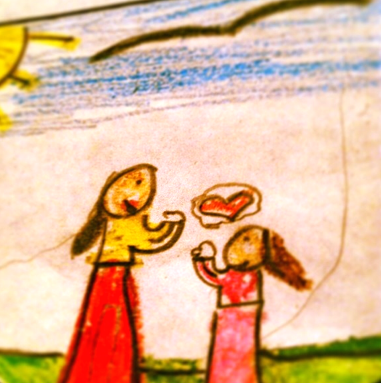 One of my favorite illustrations created by my daughter, Alena when she was in grammar school. My eldest will be going to college this fall. It’s been a year filled with highs and lows and now that the decision has been made I feel a little bit of a letdown. While I’m thrilled with my daughter’s accomplishments, I have that “Sunday night” feeling the kind I had when I was a child after watching Mutual of Omaha’s “Wild Kingdom” – airing every Sunday night I knew the weekend was over and school was on the horizon. It’s that kind of sunken feeling you experience in the pit of your stomach. I often feel the same way right after Christmas when the anticipation is over and you wonder if you really enjoyed the opening of the gifts, the food or the company. As a mom, we acclimate to the fact that our offspring is usually heading in the other direction and that’s a good thing. Hallmark events like the first day of school are seared in my mind. I can still remember my daughter’s first day of nursery school and the first time I was able to sneak out and she didn’t even notice. First days, whether it was kindergarten, elementary school, middle school or high school, always presented new problems and opportunities. I was a cheerleader for all the good and not so good conundrums but I always knew she’d be home some time later in the day. While I believe she is up to the task, I wonder if I am and I know the answer to that. I’m going to miss that “later” time where even if we fight we reconnect and she lets me in on what she wants to share. We’ve moved on from hot cocoa to tea but we always seem to be huddled together sometime in the evening during the school week discussing this or that. I know that I will be a smaller part of the equation in the future and though I hate to admit it I wouldn’t want it any other way. Our relationship gave me a taste of what a mother-daughter relationship is like, since my mother died young I celebrated most of my milestones without her. My daughter and I have waded murky waters together and many times I thought, “Oh this is what it’s like having a mom help you buy a prom dress!” From my own experience, I know how important it is to be self-sufficient and in some way leaving home is the only way kids today can reap those benefits. I learned early on that when all else fails, I could lean on myself and my daughter needs to find that strength inside of her. It’s still bittersweet to know that when we drop her off at school in the fall, this is one time where the return trip will not be a few hours later. Perhaps, I will cry all the way home or bite my lips. I’ll probably do both. Parenting has been the hardest job I’ve ever had and sometimes I’ve aced the assignment and other times I’ve failed miserably but the job was still mine. This is the first time where I feel some part of the job is fading away. While there will always be another weekend to assuage “Sunday night” feelings or next year’s Christmas to erase post-Christmas blues, I know I have to sink my teeth into the fact that this drop off is somewhat permanent and like many of life’s milestone a time to celebrate and a time to say goodbye – Kleenex in hand!